Bluets For Sale - Low Prices Online & Fast Shipping Now! Saw an adult plant at a local store for about $4 more. I look forward to and hope I can grow it to a large plant. Bluets Flower - Houstonia caerulea. 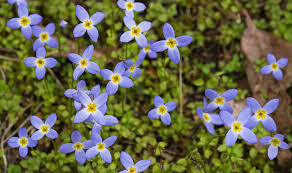 The bluets flower is a small plant that typically grows in tight bunches. The perennials are capable of growing to about eight inches tall. Predominantly found in the eastern half of North America, the plant has a collection of tiny flowers that have four lobes and a yellow center. The nodes of the flower are usually blue or white and have an oval shape. The diameter of each bulb is typically less than a half of an inch. The stem of the plant has no branches, but it does include small green leaves. Each of the stems has one flower. Bluets are tiny flowers that can add a touch of color to any garden. They are blue, and the flower is only half an inch across. They have four petals, and the center of the petals is a bright yellow color. They grow on stems that have tiny leaves on them, and there is a base of small leaves at the bottom as well. Only one flower grows on each stem. Bluets are an adorable and delicate flower. They're not even an inch wide. But they do spread a little, and they stay in groups. Their light blue with five petals then they have a dark purple inside. These are great to cover the bald spots in your yard. They will also look great around a statue or walls in your yard. Bluets blue flower is the perfect flower to choose for your garden to use in a border or a rock garden. The beautiful blue flower buds open in the late spring to midsummer months, and once the flowers are gone there is a mass of silvery-green foliage and stems left behind. The Bluet flowers grow in moist to dry soils. This flower spreads quickly and can easily be transplanted from one location to another. They can be used to cover the ground with taller flowers. They can be planted around stepping stones or along garden pathways.